Dynasty: Is The CW TV Series Cancelled or Renewed for Season Two? Will Cristal prove to be the Carrington family’s undoing or its last, best hope? Is the Dynasty TV show cancelled or renewed for a second season on The CW? The television vulture is watching all the latest cancellation and renewal news, so this page is the place to track the status of Dynasty, season two. Bookmark it, or subscribe for the latest updates. Remember, the television vulture is watching your shows. Are you? The first season of Dynasty averaged a 0.18 rating in the 18-49 demographic and 684,000 viewers. Learn how Dynasty stacks up against the other CW TV shows. Dynasty has been renewed for a second season which will debut October 12, 2018. Stay tuned for further updates. Dynasty got off to a slow start in the ratings and the numbers haven’t gotten better. However, ratings are less important to The CW than the other networks. The series is based on an existing CBS property and Netflix releases the show internationally so, word is, a deal with the latter makes Dynasty profitable right out of the gate. For this reason, I suspect that a second season renewal is inevitable. Subscribe for free updates on any Dynasty cancellation or renewal news. TV show ratings are still important. Follow Dynasty‘s weekly ups and downs. Find more Dynasty TV series news or other CW TV show news. What do you think? Are you glad that the Dynasty TV show has been renewed for a second season? How would you feel if The CW had cancelled this TV series, instead? I love Dynasty. Can’t wait for it to come back on. Can’t hardly wait from week to week for it. 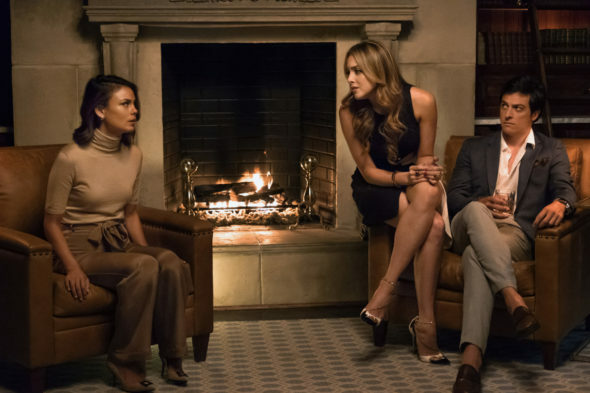 Dynasty is amazing, the best and funnest show I have seen in a long time, right off of the heels of Gossip Girl with an actress and some music from that show too. I’m glad they booted Krystal – the character is very much of a do-gooder but the actress was not being able to convincingly play that role. Excited to see who will play the Colbys’ mama. Wow! Where did you find Season 2? I’ve been looking everywhere! I am 70 and love the show though a bit corny, I love the clothes I was a fashion merchandiser for a big company and love to see what every one is wearing, I do yoga while watching on netflix love the kiwi butler, hope there is a season 2, such OPULENCE!